Small vintage table perfect for your kitchen. 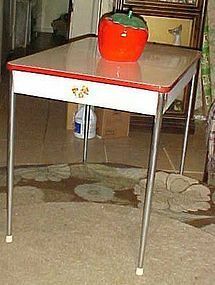 Chrome legs and has a porcelain enamel top with red trim and little strawberry decals. Top measures 25" x 40" and is 30 1/2" tall. A few chips on the edges. Nice and clean looking. Local pickup only. 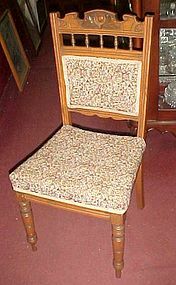 Wonderful set of four antique carved chairs in wonderful condition. Covered with a nice woven tapestry chintz fabric with soft pinks, greens,cream, and a touch of blue. Sturdy, clean, not scratched or dinged up or repaired. All are in the excellent condition as you see in this photo. I even have a wonderful 54" square oak table that is available for purchase also if interested (just ask). These are local pickup only. Sorry I can't ship these.